This perennial has much to offer - The tufts of grass-like leaves give rise to dense spikes of mauve to lavender coloured flowers in the early summer. The unusual trait is that the buds open from the top down, quite the opposite of most plants. Add to that the dramatic appearance of the dried spikes in the fall above foliage that turns scarlet, and you have a perennial winner. Height to 5 feet; spread 2 feet. 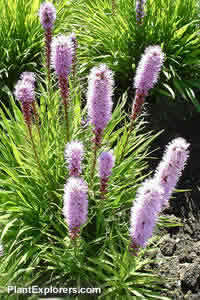 The genus Liatris is now in the family Compositae. For maximum freshness, please keep seed refrigerated in its original packaging until it is time to plant. Sow seed in containers in a cold frame in spring. Grow in well-drained, moderately fertile soil.